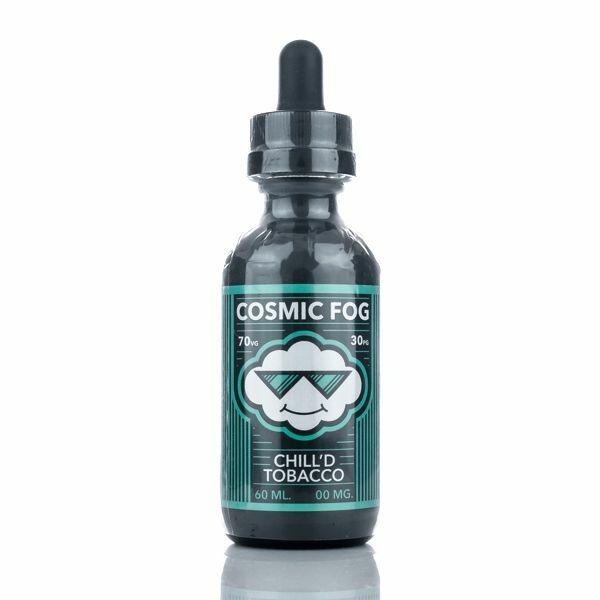 Chilled Tobacco Cosmic Fog E-Juice 60mL is the last tobacco blend you'll ever need to try, as Cosmic Fog has created a unique yet delicious blend that will have you coming back for more time and time again. This liquid is comprised of a mild leaf tobacco blend that is expertly mixed with a fresh peppermint background and finished off with subtle hints of a chocolatey exhale, leaving you with a great tasting tobacco blend that is sure to satisfy those hard to beat cravings. Cosmic Fog Vapors hand mixes each of their premium vapes 100% of the way in an ISO8 facility using only the highest quality USP certified ingredients including vegetable glycerin and propylene glycol with a mix of 70/30 VG/PG for great flavors and massive clouds. Chilled Tobacco from Cosmic Fog can be purchased in 60mL GCC compliant glass bottles with strengths including 3mg, 6mg, 12mg and nicotine free.